The IoT marketplace needs a framework—an architecture to support how businesses interact with each other, compete with each other and complement each other. This creates an opportunity to create alliances with other companies. Keeping cloud-stored data viable may be as simple as taking the data to the edge of the network where edge computing is rapidly becoming the future of storage and data retrieval–and the user experience. For instance, if each of those 50 billion mobile devices is sharing videos, uploading high definition photos or using their smart phones to manage their interconnected homes, then the IoT has the potential to become untenable. When companies take their data to the edge of the cloud network, that potential diminishes. Data is closer to the user. Data is closer to the companies managing it. Company interoperability becomes part of the framework that has yet to be standardized. How do you regulate the Internet and its applications? How do you standardize a marketplace that is purposefully proprietary? For the IoT to thrive, the IoT marketplace has to get past these limitations. 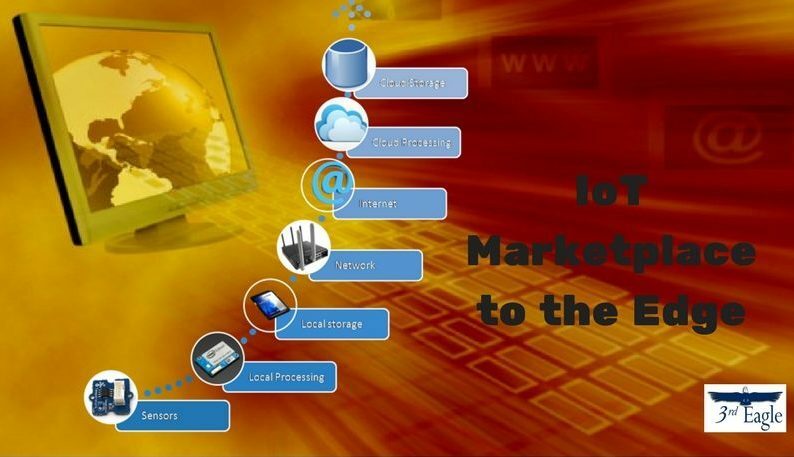 It’s within fog computing that the IoT marketplace makes headway. Connectivity goes way beyond how many devices are communicating with each other and how much data is stored in public and private clouds. This connectivity is an infrastructure that begins with the user experience and ends with applications that offer reliability, less data vulnerability and greater quality of life for those interfacing with data that doesn’t lag inside the cloud. Sustaining an architecture that promotes healthy competition is smart business. Each company in the IoT marketplace must consider first the user experience and work together to address the challenges of that user experience. By designing and implementing products to keep the IoT functional and growing, the marketplace must rise to meet the challenges of rising security, privacy, data and standardization within new IoT applications. IoT companies will only survive with strategic alliances with other technology companies, as well as industry associations, and vertical experts. For help managing these new relationship challenges, contact us. George Tyler is Chief Alliance Officer for 3rd Eagle, an organization devoted to enhancing strategic alliances to grow your market share. This entry was posted in Alliance, Collaboration, Internet of Things, IoT, Partnership, Strategic Alliances and tagged alliances, business alliances, Internet of Things, IoT, partners, strategic alliances by GeorgeTyler. Bookmark the permalink.